Add a classy yet a retro slant to your ethnic-inspired casual dressing with this pair of green sandals from Inc.5. 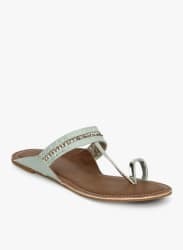 Featuring glossy taping, braided strap and cutout details on the leather upper that give it an elegant touch, this pair of sandals is completed with comfortable rubber sole. It will look pretty with traditional attire and feminine dresses.